This is a side project of mine. I always like the design of SIC figures. But the head sculpt of Tackle leaves something to be desired. So I made a bishoujo style head sculpt for it. I called it Denpa Hime (electric wave princess). I based it on the appearance of Tackle in the Decade Movie. If you thought that the face looked similar with a certain character from One piece, that was no coincidence. 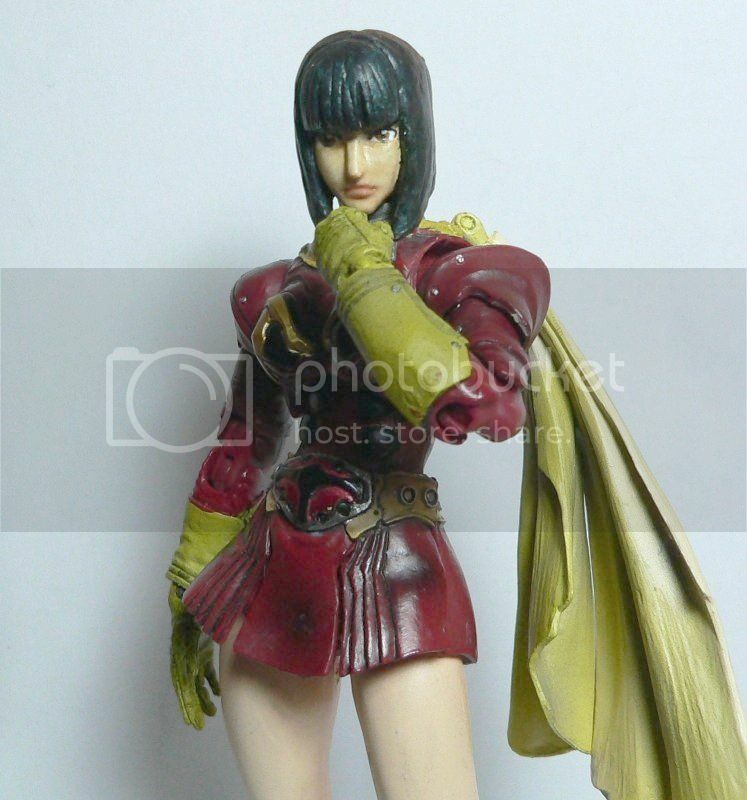 I use the POP Nico Robin to model the face. More pictures and story on the making of this after the break. The project started as a sketch. This was done using my softest wax, MwaxZ E. It's like a practice run, seeing how things comes together. After getting the shape right I resculpted the head in my harder wax, MwaxZ L. The harder wax made it easier to add in details without the worry of deformation. The next step was to transfer the wax sculpt to a more permanent material. Unfortunately I didn't document the process. To sum it up here's what I did. Using epoxy putty, I used MpoxZ, I made a 2 part mold of the head. Then I cast the head by pushing epoxy putty into the mold. The cast needs cleaning up, but because it's done in epoxy putty you can sand, grind, and smooth it. So I did and the I painted with acrylic paint. Something's off with the eyes, so I repainted the eyes and top coat it in matt varnish. I also use some washes to further blend the skin tone and made it richer. All in all, it's a fun side project to do. And it made me realize that I need to learn more on painting, especially blending with acrylic paint. There are some new material in the coming weeks. One of them the tutorial/guide that I've promised many moons ago. Thanks for reading and happy sculpting! 5 Tips to Be a Successful Artist! Recasting now with English Caption!